The broadbeans and peas are putting on a little height, and the pear trees are in bloom. Three more flats of the stunted greens -- collards, cabbage, turnips, kale, bok choi, chard and lettuce -- are added to the three beds. The beds are wider than they look here because the paths have slopped over onto them. So I'm comfortable with planting right next to the paths. Slugs have been absent, oddly enough, though this is the kind of environment that thrills them. But I am getting some damage from escargot-sized snails. I go back and plug a new plant into each gap. Starlings have been building a nest in the soffit above our garage entrance and a few days ago, I excluded them with a bit of plywood and four screws. They have not yet elected to go elsewhere and sit on the power lines above me, calling me names all day. Sorry, kids, it's a rough neighborhood. Gaps in the weather have allowed me to paint the long wall by the creek, where the house tries hardest to mold. I include some of our homemade vinegar in the paint, with some salt and that seems to help. I mowed half the pasture yesterday and hope to mow the other half today. At this time of the year, it's full of clover and not seedy so I'm bagging it all and hauling it to the compost heap, where the pile is already tall, green, and steaming. Later in the year I'll chop-and-drop the going-to-seed pasture to maintain its fertility, mulch it against moisture loss, and discourage blackberries. I put the mower on its tallest setting, allowing the cut grass (it's really more of a meadow) to continue shading its own roots, preserving the green cast of spring well into summer. This year, though, we think we will go brown early. The neighbors all tend to cut low, and their grass browns early. They bag and toss. I'd ask for the clippings, but I think they may contain weed-and-feed. Instead I take over a dozen eggs and chat. If hard times come, I want to be referenced as generous-natured. Moths, which are sprouting from grubs in the pasture ground, sense the approach of the mower and rise into the sky ahead of me. These are the survivors of feasts wherein flocks of birds, usually the starlings, have gone over the ground grub-hunting. Along our road, there are "swipes" on the edges of the ditches, where a bear or bears have turned over patches of sod looking for these grubs. I don't think any of the neighbors have noticed about the bears -- or anyway they have not mentioned it. It's always what nice weather, what a cute dog, are you retired, we like your ducks. And I respond in kind: how do you like your new car, my the kids have grown, lovely daffodils you have this year. I keep the bear to myself. We do what we do, and we see what we see. Waiting through dry spells to set out transplants in wet spells; waiting through wet spells to paint and mow. The potted seedlings are growing slowly this year in spite of their heat and sun lamps. It takes eighteen flats of seedlings to fill the three spring-garden beds. I choose three at a time. I know I'm rushing it, but there has been so little frost that one wants to try. I'm afraid the heat will come suddenly and the spring things will want to bolt. The green stripe you can see down the middle of each bed is broadbeans, the best eating size of favas. Their job here, aside from creating the beans, some edible foliage, and some soil nitrogen, is to shade the greens a bit and help stave off the anticipated intense summer sun. Broadbeans are not as favored in these parts as in Europe. Americans have the idea each one must be peeled. Not so, but you want to get to them quickly after picking and shelling. Fresh is key. Frozen too, but again frozen fresh after a thorough blanching to stop the outer shell from armoring up. Good alone or in savory soups. You may also use the tender young leaves as a salad ingredient or in stir fries. Again, this year, we have largely held off buying seeds as we have so many. I combine most of the year-old to three-years-old greens-and-roots seeds into a mixed lot in a shaker and shake out some over a flat of potting soil, then add a bit more soil, then water and light and warmth. anything that gets big enough is pricked out and put into its ow three-inch pot. Flats going out to the garden, a few weeks later, have eighteen plants each, which I randomize in the beds. In each hole there may go a Russian kale, a collard, a Red Sails lettuce, a Black Seeded Simpson lettuce, a Forellenschluss lettuce, a turnip, a green cabbage, a red cabbage, a Bok Choi, a borage plant, a calendula, a beet, a radish, a mangel, a Fordhook Giant chard, or a spinach. That seems to be the current mix. Carrots don't seem to perform well in this environment, so I have reserved them for their own setting, deep planters that are currently in the greenhouse. The three inch pots and their flats are plastic, yes. We don't buy them intentionally; they show up -- mostly with nursery plants. I get about ten years out of them. The tool shown here is a modified (bent) cheap trowel as recommended by Eliot Coleman of Four Season Farm. It works very well. This one was lost in the garden three years ago, was recently turned up by the broadfork, and has been put back in service, none the worse for wear. Simplicity in tools, as with so many things, is its own reward. Jizo is looking a little less lonely in his nest of violets. We had a spate of rain and I took advantage of the changed conditions to see about getting some greens out to the garden. These will be in the beds nearest the house in true kitchen garden fashion. Also they are vulnerable to slugs so they want to be inspected frequently. Trellises have been in these upper beds for the last two years so it is time to have them in the lower garden. I have already set up the one for Sugar Snap peas (planted last week) and green beans (not yet!). I also need one for scarlet runners and cucumbers, maybe also some vining squash, and have gathered the necessary materials and set them out. We have fifty foot beds, so it's three tee posts per trellis, 25 feet apart, and about 40-48 poles. I select poles from the coppice and cut them near the ground. If they're too tall for the job, which should be ten feet for scarlet runners, eight for everything else, I just firewood the stump end until they're the right height. This year's new poles are about 2/3 hazel and 1/3 bigleaf maple. Garden authors tell you that going vertical like this saves space, but a thing I like about it is it cuts back on the sunshine on the adjacent beds, cooling the earth in July through September and reducing sunburn on the crops. That's getting to be a consideration here. Not until the poles are up do I bother limbing them, and even then I only cut the branches that reach into the path, mostly so as not to put an eye out. The others might as well stay and provide the climbers all that much more choice in climbing. Plants like to be catered to as much as anybody. One might point out to me that the hazels shown here are so tall I won't be able to reach the beanpods. I would then reply that I'll be able to reach about half during the eating harvest. The ones "out of reach" are for seed -- for next year. God willin' an' th' crick don't rise. Drought fighters. Mulching the paths -- not so much to hold down weeds yet -- they aren't sprouting; it's too dry out. The soil is turning into dust and I want to lock in all the moisture I can while I can. The beds are not as bad, because they already have a lot of organic matter in them. And I don't want to mulch them in the spring months as they need to heat up in the sun. This paper is 3-ply feeds sacks, not coated with wax or plastic, cut apart to get six sheets per sack. We're covering the paths with paper and straw. This will cool the paths and lock in moisture. It's not Ruth Stout's nine inch mulch but we have to let some solar heat in. As the south slopes heat up, we get a breeze from the river that wants to blow the sheets around, so I water them to hold them in place till the straw arrives. The straw is local but that's about all it has to recommend it. No, this is not really organic gardening, but almost. Each of us has to draw our own line, and I want something to eat. We hose down the straw to tamp it down out of the wind a bit. This stripey look is kind of neat but the straw will darken and in a couple of weeks will match the beds. We're in a persistent dry holding pattern with thirty degree swings. A bit of rime on the gates in the morning, a little hot (considering it's March) in the afternoons. A little bit of chill in the house calls for a fire, which will be allowed to go out after the day gets rolling. I want to get the peas in now, as the heat trend is worrisome, which means setting them out in full sun. I'll work in the cool part of the morning. I'm getting used to the narrower paths and learning to face down the path, working by my side, instead of across the path, working directly in front of me, as I am used to doing. I'd face away from the sun, keeping the roots of the peas in my shade, but it's downhill (even if it does not seem so in the photos). So I just try to work fast. Fortunately there's a layer of last year's mulch on the surface, and by fluffing this up a bit I can shade the peas as I go along. I'll water immediately after setting out the seedlings, and water again later in the day, for insurance. After this it's hot enough to paint. Time to climb on the roof and start putting white paint on where the white had faded over the last couple of years. I have a feeling we're going to need all the albedo we can get. As there are still a couple of possible frosts in the near term forecast, I'm not doing much in the garden, but I did plant a bed of potatoes. Where there have been, in the past, three rows of potatoes in a bed, here I am doing two. Beds are narrower, this year, as long term readers (there are a few!) may notice, in an effort to make each bed get by on a soaker hose, as we are in drought for a second year (and we anticipate a lot of 90+ degree days) and must conserve the well. Where there have been six beds, there are eleven. Foliage, when the plants are fully grown, will cover the paths more extensively, and the increased shading should help conserve moisture as well. In the "greenhouse" there is a lot happening, but everything there is young yet. Baby steps. I'm watching for a spate of (rare) rain in a few days. If it materializes, I'll set out the first flat-grown peas. None of the ones in the garden (from the same batch, so I know germination is good) showed up. I suspect birds, especially the towhees, who have been kicking up the beds something awful. Every year, surprises. to leave creatures dazed by too much fortune. unalarmed as any fattened squirrel. and also shade a loafing spotted newt. wrapped in a druid's dream of mistletoe and ivy. There I had paused for dandelion wine. Perhaps the trail will help some find this place. My children, do not forget there is a world. 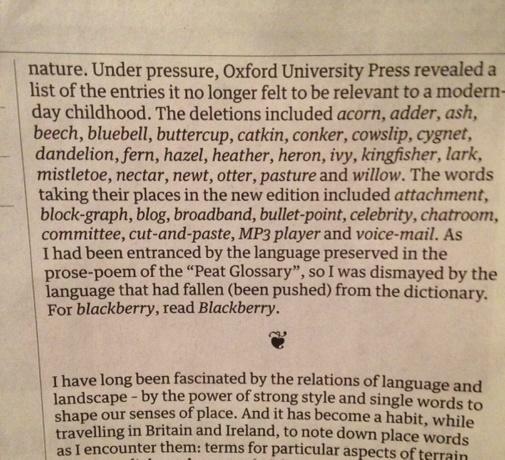 This was written in response to a report, by the great writer Robert MacFarlane, of the disappearance of certain words from the Oxford Junior Dictionary.